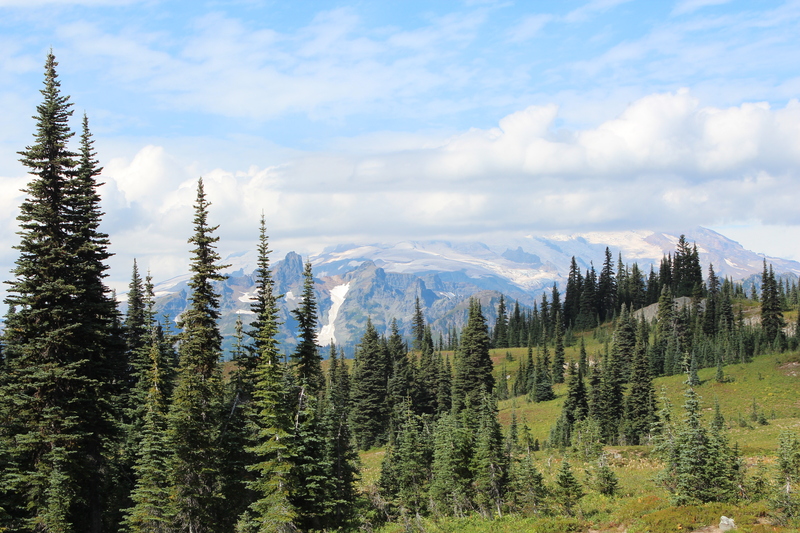 Early autumn is a perfect time for hiking in the Pacific Northwest. The bugs have died down, the weather has cooled, but the sun is still shining. And thus my husband, Gary, and I headed out Tuesday to enjoy the outdoors. 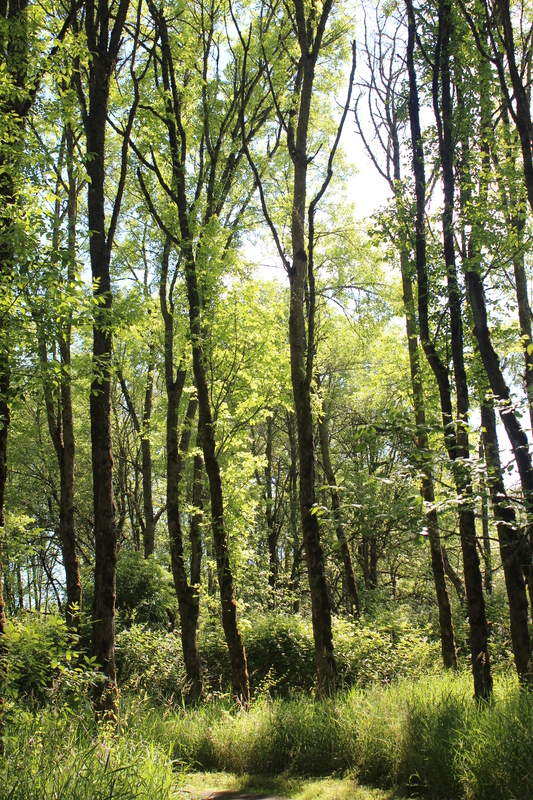 Looking through 100 Hikes in Northwest Oregon and Southwest Washington by William L. Sullivan, I noticed two short (2-3 mile) hikes in the Columbia Gorge, so close to each other that they were together in one entry. 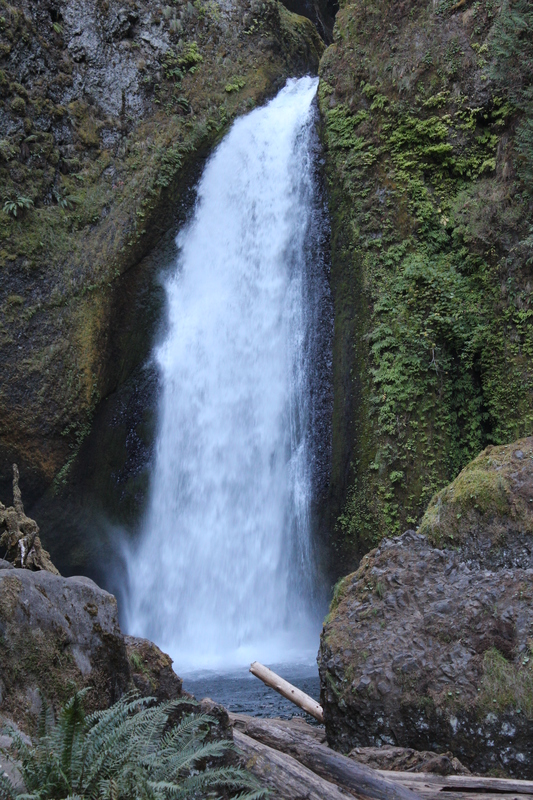 Wahclella Falls and Elowah Falls. 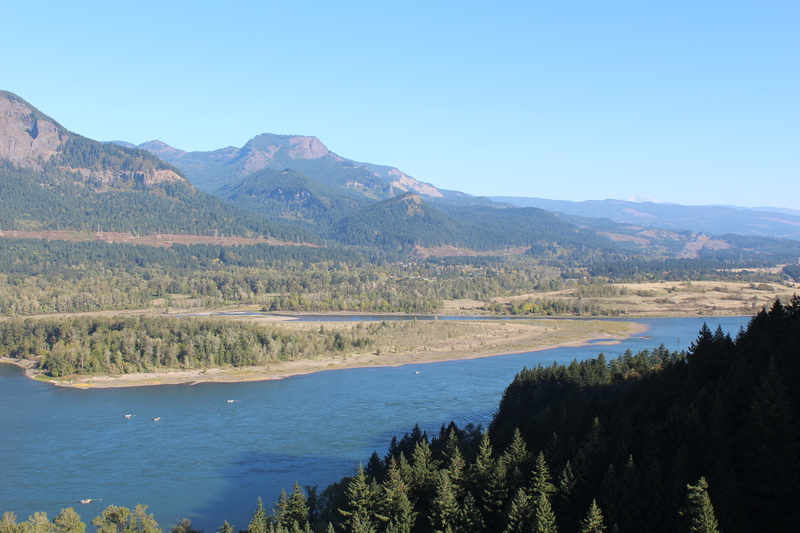 Despite our proximity to the Columbia Gorge, we’d never hiked either trail. Time to check them out! 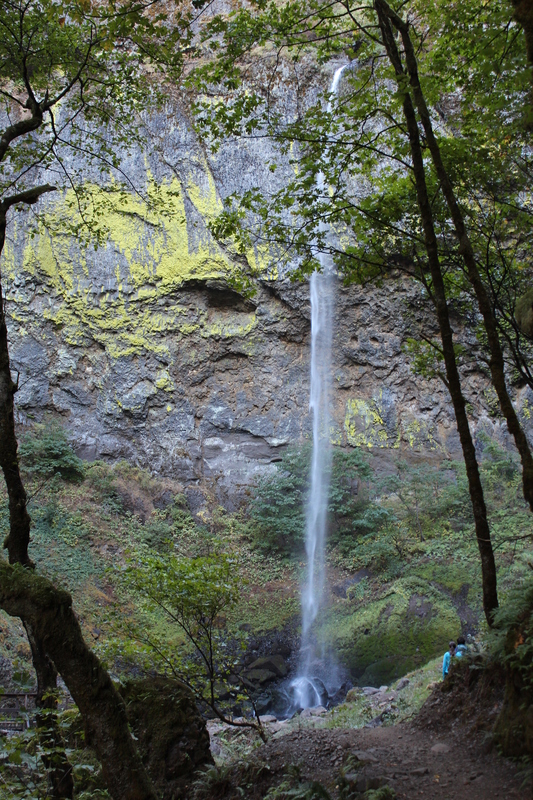 The first one as we drove east through the Gorge (Oregon side) was Elowah Falls–with a bonus falls available (Upper McCord Creek) with a little extra uphill walking. The trail headed gently uphill, becoming a bit steeper on the Upper McCord part. It passed through shady forest, unfortunately close enough to hear the freeway sounds for much of the way, but finally heading back into the woods a bit. The McCord part opened up to a nice view of the Columbia River with Mt. Adams in the distance (I was thankful for the railing here, as the dropoff was steep.) before arriving at a nice, though rather small, waterfall. 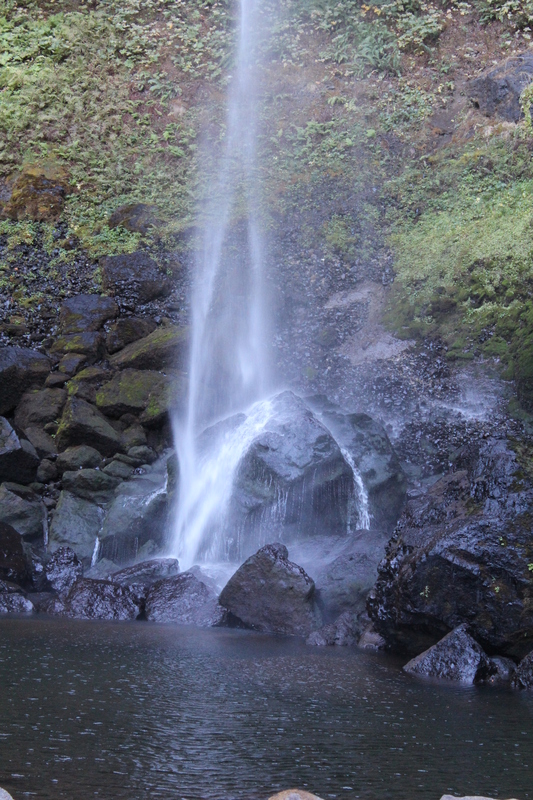 We explored a bit, then headed back toward Elowah Falls. As we neared the cascade, we could feel the temperature cool, until we came out in the rocky area below the falls, a fine place to rest and enjoy the view. Elowah Falls itself tumbled down from the cliff like a long, feathery tail, its pattern constantly changing, fascinating to watch. 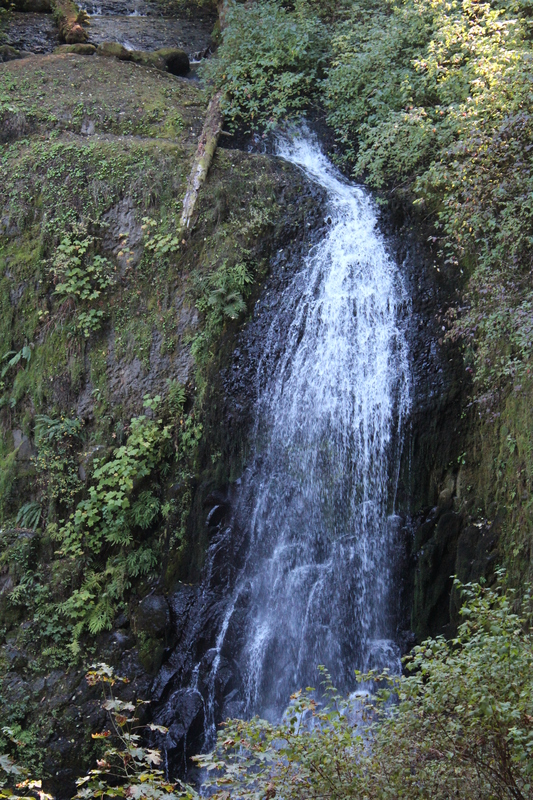 We left Elowah Falls, deciding to drive the three miles or so to Wahclella Falls and see what it was like. We were glad we did. 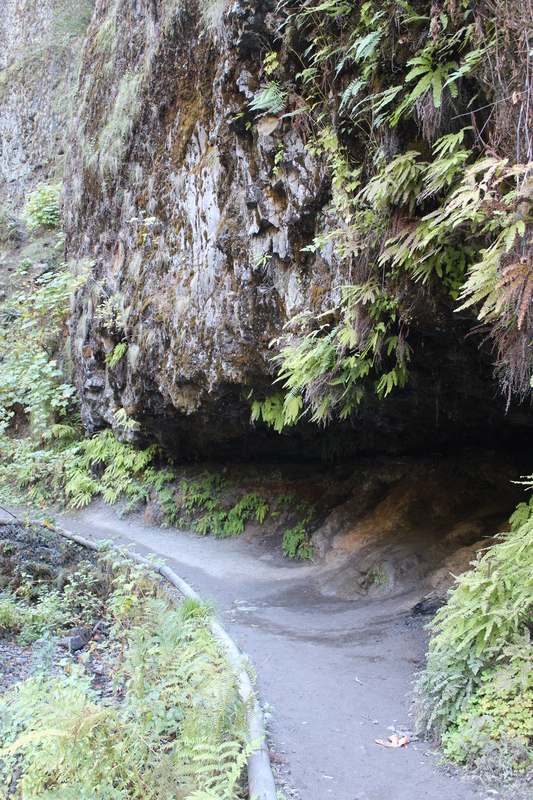 The Wahclella Falls trail began as a gentle stroll along lovely Tanner Creek. We watched a pair of dippers zipping from rock to rock in the stream, whistling merrily. Sunlight sparkled on the creek, but the path was shady most of the way, a good thing as the afternoon was warming up. The path climbed higher above the creek before dropping back down to the falls area. Which was beautiful. Wahclella Falls poured into a deep pool, which emptied into rambling Tanner Creek. We sat by the falls and ate our PBJ sandwiches, then wandered on–with many photo breaks along the way. Gary had to explore a little cave near the river–apparently it went back quite some ways, but wasn’t high enough for easy exploration. We meandered on through the rocky little valley, across the creek and back up to the main trail. 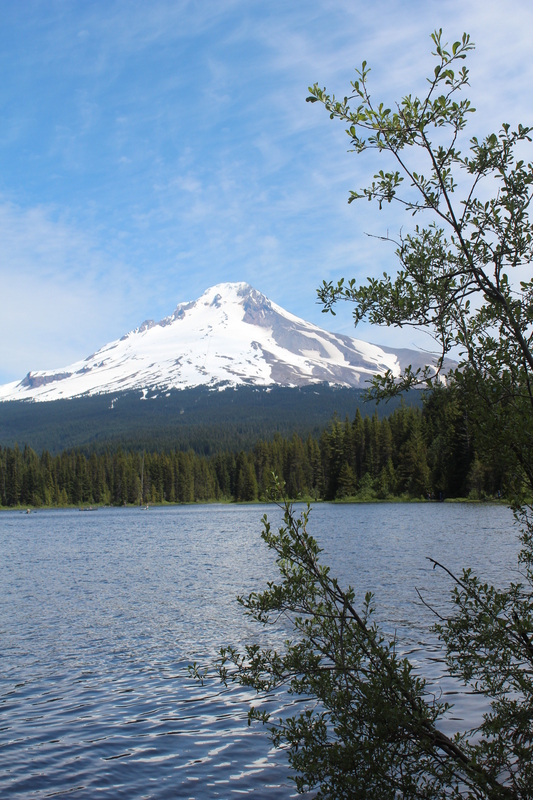 It is a hike I certainly plan to return to–a little gem I am so glad we discovered. Amazing that we can live in one area for so many years and yet miss out on nearby places of beauty. Why had we never thought to hike those trails before? It’s a reminder to me to watch for beauty all around, for even the familiar places we take for granted may be wondrous if we keep our eyes and hearts open. 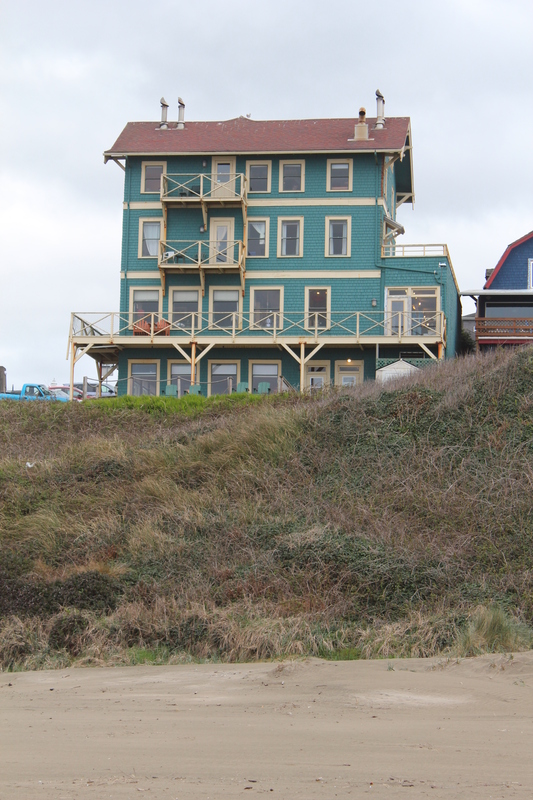 We sit in the comfy chairs on the third floor of the Sylvia Beach Hotel in Newport, Oregon, gazing out at the gray sky and the rolling white caps. It’s our 36th anniversary, and we came to celebrate in this wonderful book-filled hotel. But my mouth hurts from the tooth that had to be extracted yesterday, and husband is coughing from the cold he caught recently. In our younger days, this might have ruined our special day. However 36 years give one a little perspective. 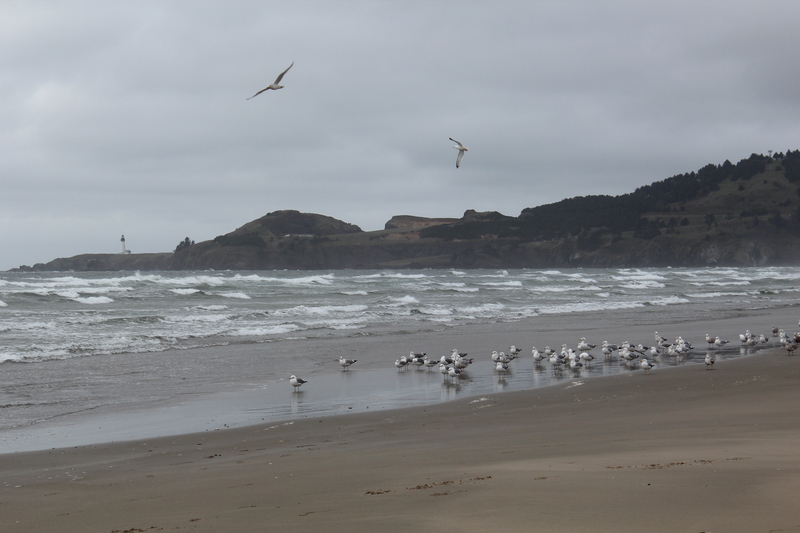 Seagulls soar past the windows, pushed by the wind. The sun peeks out briefly to light up the waves. Husband sketches a beach scene; I write these words. 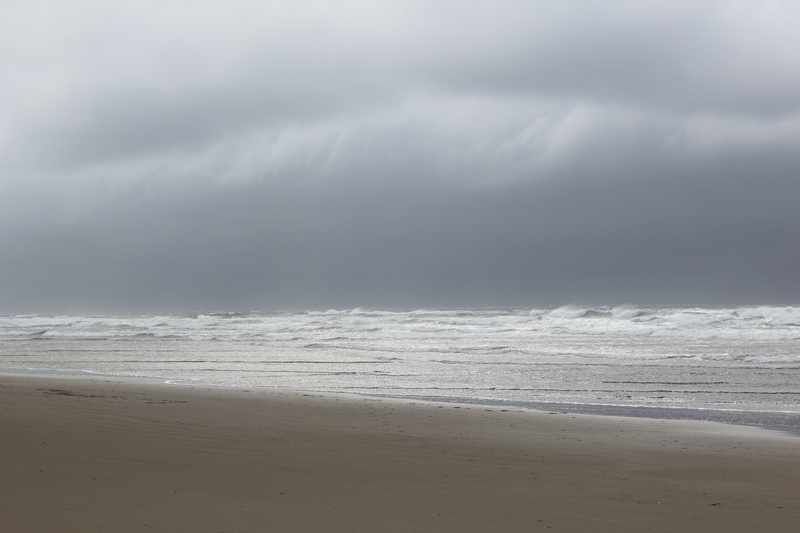 The ocean beats a constant rhythm into our souls. We are at peace. Life needn’t be perfect to be good. So many times our expectations prevent us from enjoying the blessings we receive. 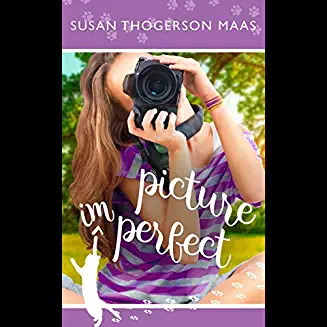 We want the perfect job, the perfect wedding, the perfect spouse, house, and kids. But life has more glitches than a new computer system, and perfection is a rare commodity here on earth. And what’s so wrong with “good enough?” We all have things that keep our lives from being perfect—whether health issues, money problems, disagreements with family or neighbors, job hassles, whatever. We can spend our days bemoaning our problems, or we can accept what we are given and make the most of it. We can enjoy the blessings we are given. It’s that time of year again: the Great Backyard Bird Count! I’ve been putting out extra goodies for the birds and faithfully counting–or trying to count–each feathered friend that drops by. 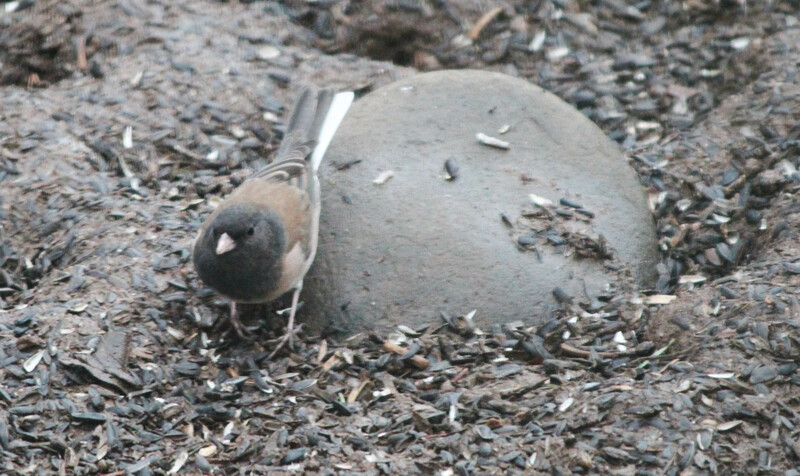 It’s as much a challenge as ever to get an exact count of juncos that blend into the winter ground and chickadees that flit in and out, so that I can’t tell if the one at the feeder now is a new bird or the one I just counted. 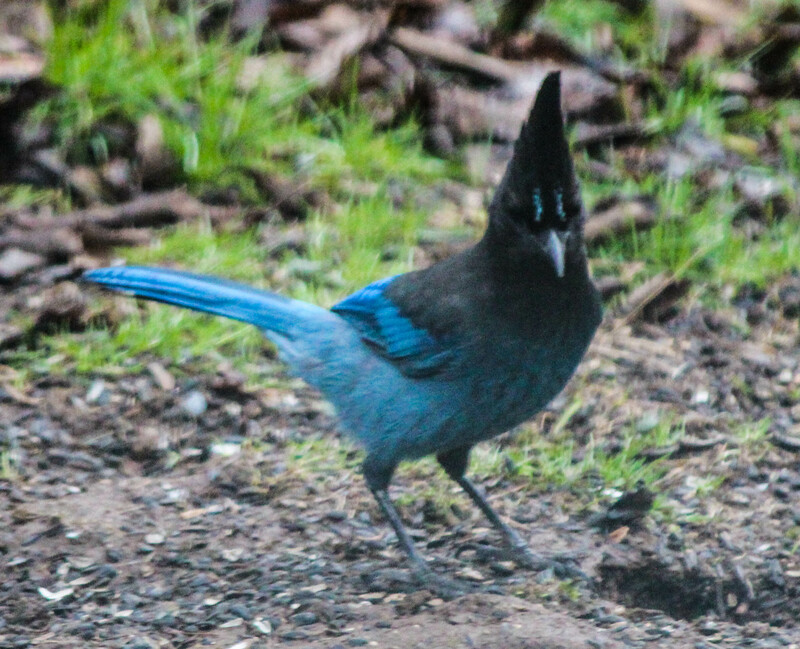 The big birds are easy–the jays, flickers, varied thrushes. But those little gray and brown guys–whew! And then there are the “missing in action”–the birds I know are around somewhere, but that won’t come by to be counted. The cute little bushtits haven’t dropped in yet. 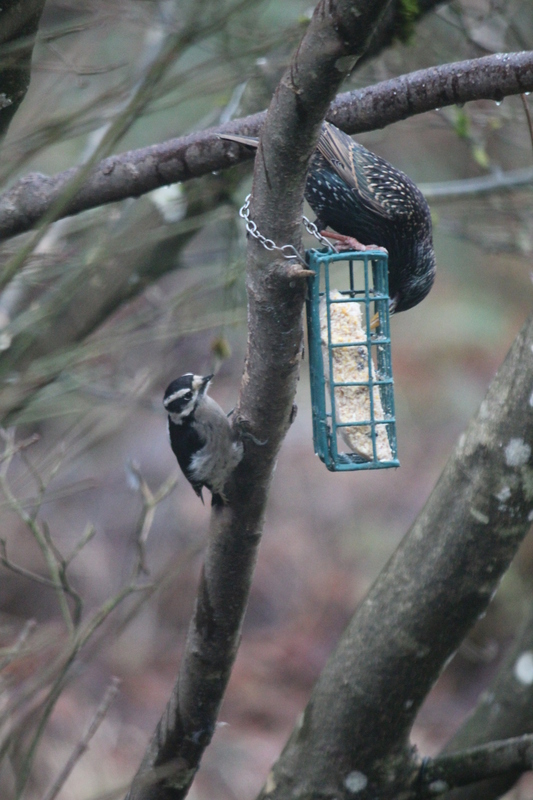 One downy woodpecker visited the suet feeder today, but the hairy woodpecker hasn’t been by. I only have robins because I took a walk and saw them down the street. There’s still one more day left, so if you want to take part, throw out some birdseed and see who shows up. It really is great fun watching the birds interact as they gobble down the food–some of them are real characters. Give it a try! 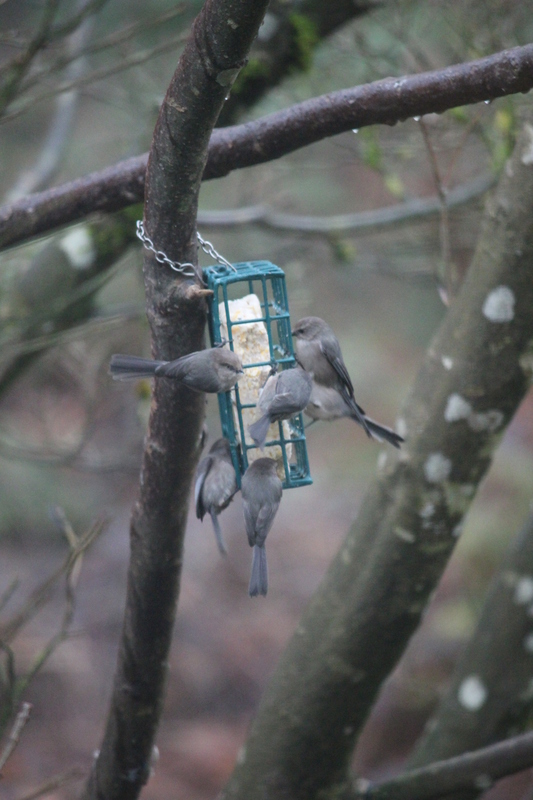 And here are some of the ones I saw today, filmed through the window, so please excuse the blurriness. 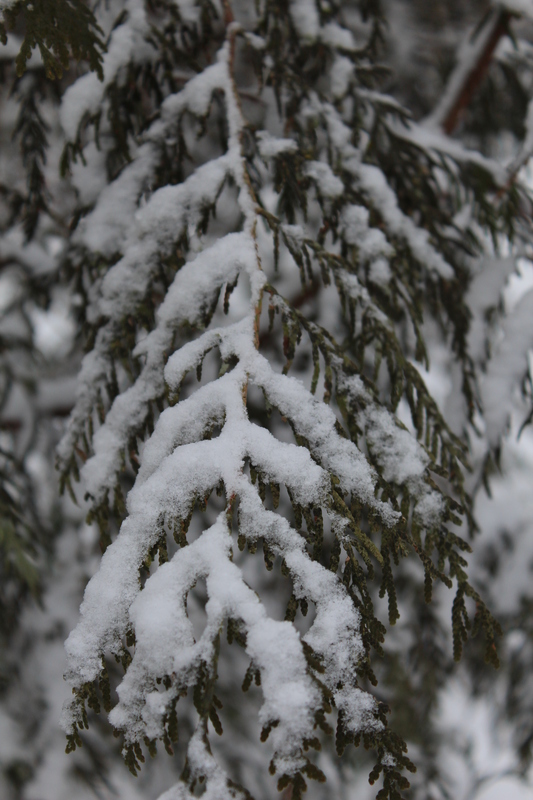 The first tiny flakes danced and twirled across the sky like dust blown by the East Wind. After awhile they began to settle into little drifts in sheltered areas where the wind couldn’t blow them about. By evening the wind died down, but the snow kept coming, covering the brown winter earth with a cool blanket. Morning light reflected off the whiteness, all fresh and new. 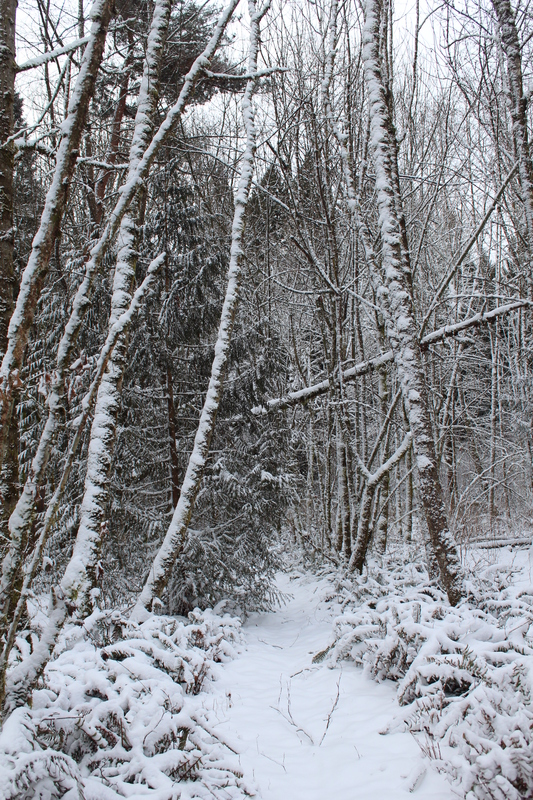 I ventured out before work–glad that I work at home–to take pictures and enjoy the magic. It rarely lasts long around here. We threw out extra sunflower seeds for the birds (and nuts for the jays and squirrels), trying to find places where the seeds wouldn’t just sink into the soft snow. The flower boxes on our porch worked pretty well, once the little sparrow types noticed. Then came the ice. 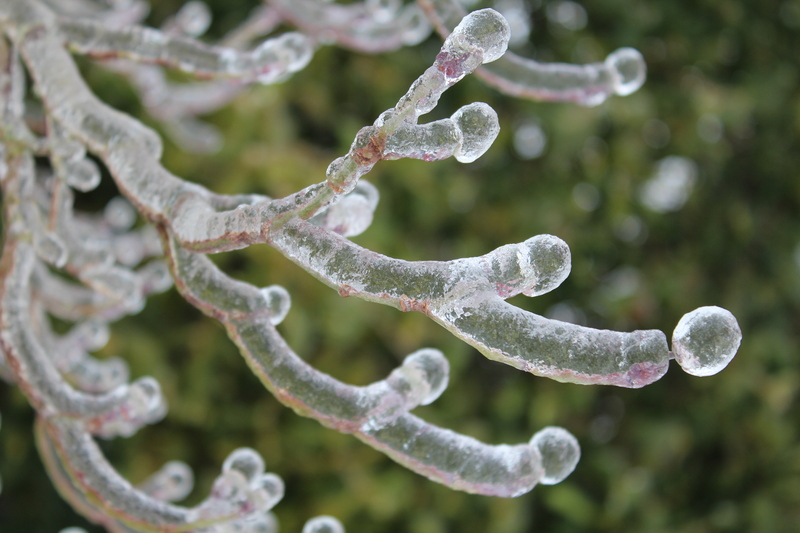 Sleet, then freezing rain, coating everything within its reach. The fluffy snow gained a crunchy coating. 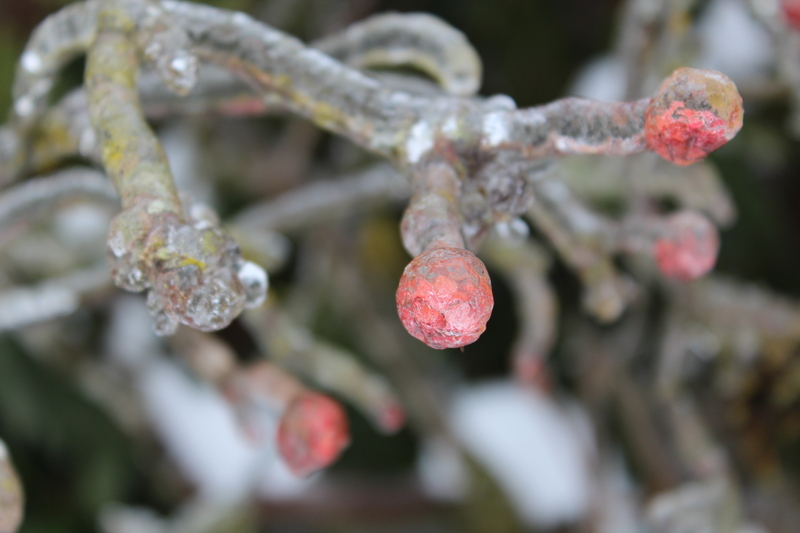 Every twig and bud became encased in crystal. And again the birds gathered–the shrieking Steller’s jays, varied thrushes, flocks of juncos and sparrows of various types, energetic chickadees, and, of course, the squabbling starlings. Two Anna’s hummingbirds chased each other in and out of the porch area, battling for control of the hummingbird feeder. It was quite a show! Life goes on in the snow and the ice. And I watch as the fire in the woodstove merrily crackles and pops, and water for tea heats up in the kitchen. Beauty comes with the cold, but I’m still glad that I’m not a bird. 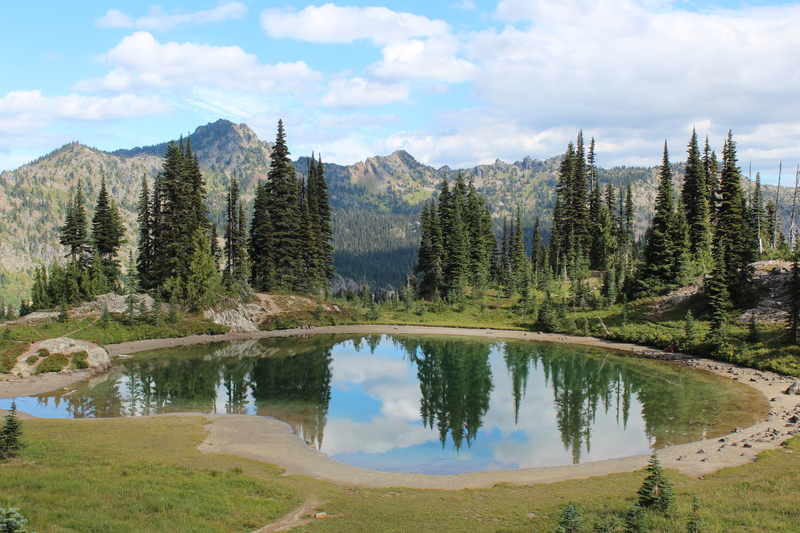 “On a clear summer or crisp fall day, this might be the finest day hike in Washington,” the trail guide said. (Day Hike! Mount Rainier by Ron C Judd with Seabury Blair, Jr.) I would have to agree. 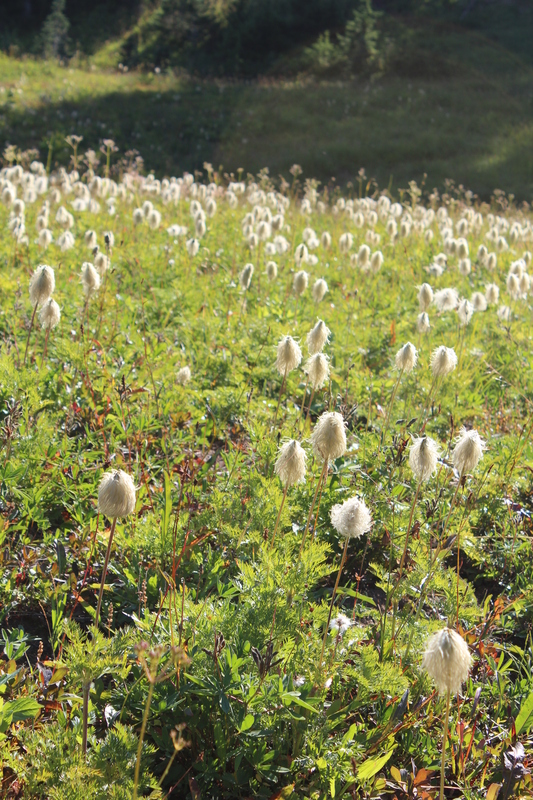 My husband and I set off on September 4, as the morning sunshine lit up the white fuzzy heads of Western anemones. Meadows all along the route held the remnants of what must have been a riot of color just two or three weeks before. Now a few asters, some lupine, and an occasional monkey flower by a stream remained to hint at summer’s beauty. 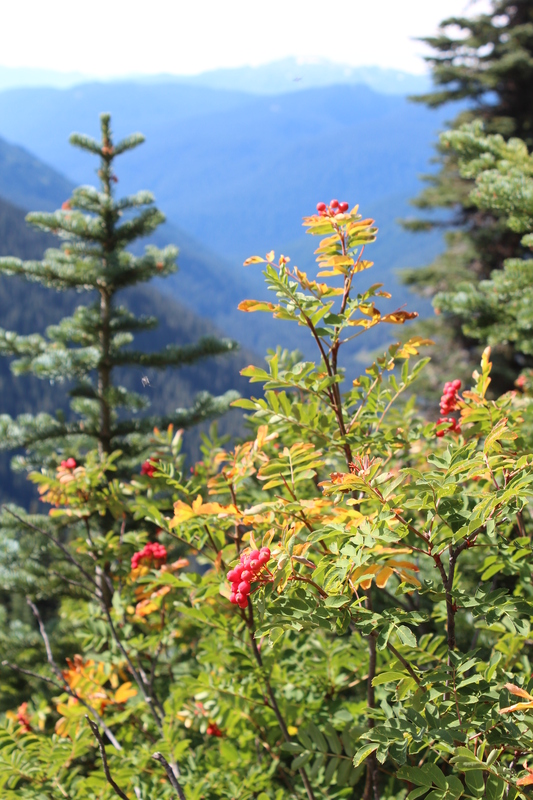 Dwarf mountain ash held bright orange fruits, and huckleberry plants hid sweet, blue treasures under their leaves. We munched as we walked. On a larger scale, the views were magnificent. Jagged rocky peaks surrounded us, a few with patches of snow still accenting their slopes. Blue mountain tarns reflected stately fir trees and white clouds. Peace descended upon us in the silence, broken only by the caws of a crow, the chipping of juncos in the trees, and the hushed murmur of a cool breeze. An uphill climb brought us face to face with Mt. Rainier itself. Sadly, clouds veiled its peak, and we could only glimpse the white skirts of snow on the lower section. 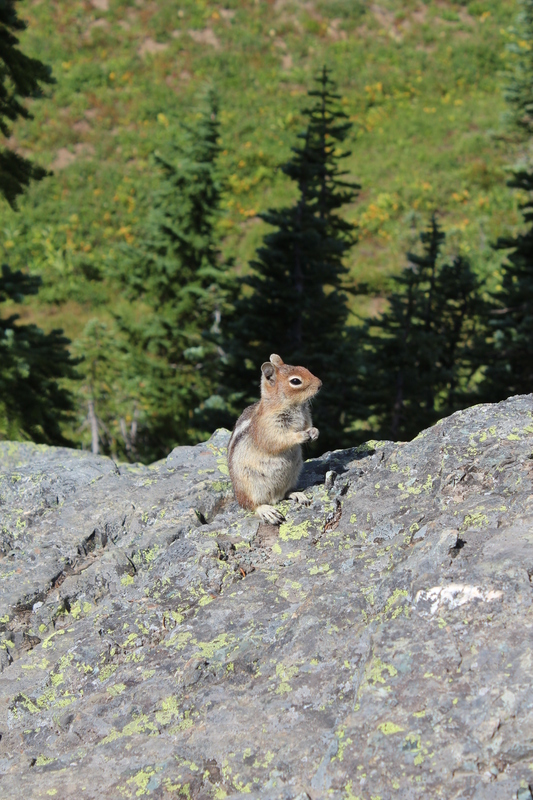 We stopped to rest on a rocky area, where a friendly chipmunk—or perhaps a ground squirrel—agreed to pose for me. 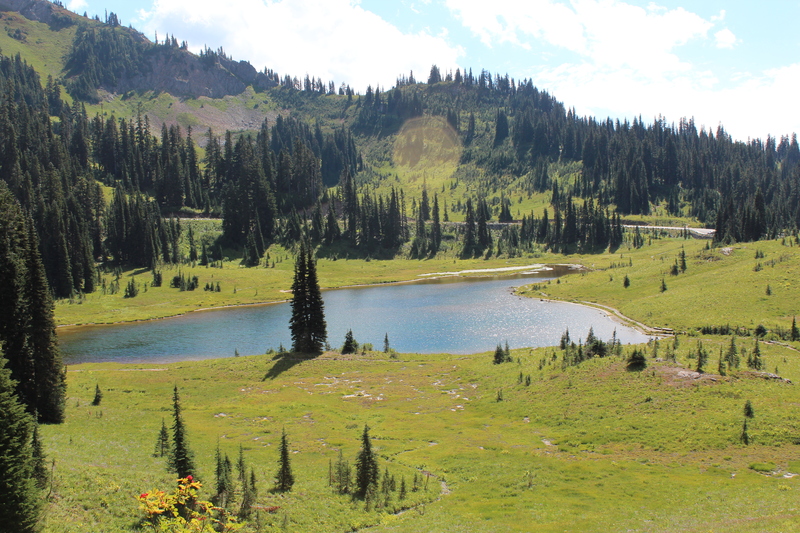 Then on back down, past Tipsoo Lake, an opal set in an emerald field. Over one more ridge, then down to the truck, with enough huckleberries in my pack for a lovely pancake breakfast. “How can people see this beauty and say there is no God?” my husband wondered. I couldn’t answer. Time is our most precious commodity. It slips away so quickly, whether we are busy working or playing. We want more of it, but few of us know how much we really have. And when we receive an unexpected abundance, we tend to waste it—at least I know I do. Yet there are days when time seems to stand still. 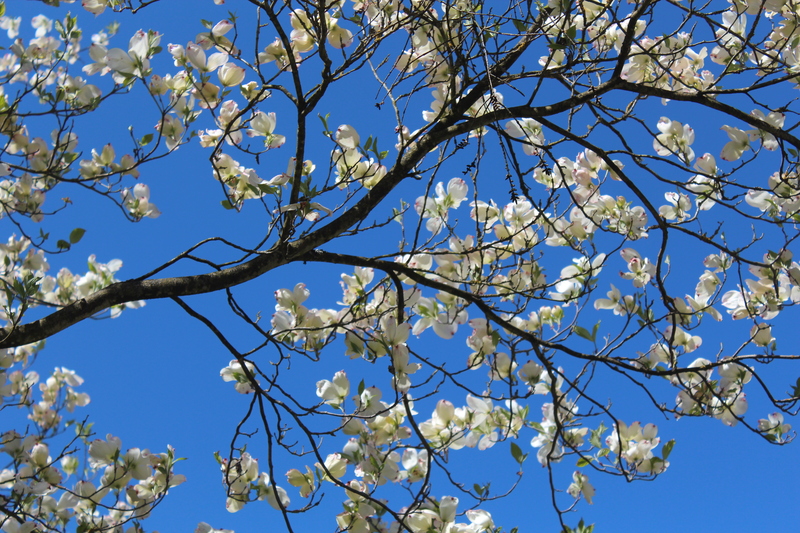 I look at the blue sky and hear the robin singing in the dogwood tree, the chickadees chittering away near the bird feeder. I feel the gentle breeze on my face. 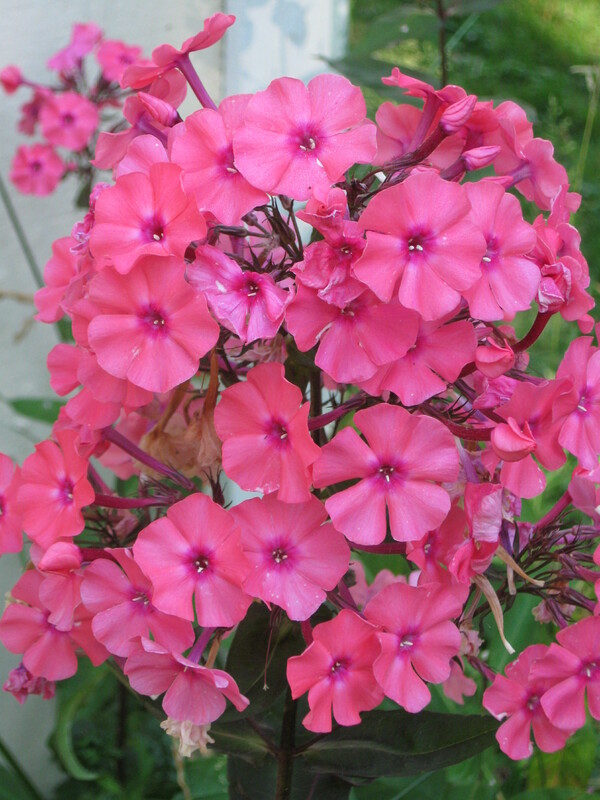 I smell the sweet scent of the pinks that grew from starts given me by a former neighbor, now passed on to eternity. Eternity seems only a thin veil away as I walk through the green woods or stand on a cliff, surveying the forest below, the mountains in the distance. I feel God’s breath on me as I drink in the beauty. And I wonder: if this is a fallen world, what must heaven be like? Heaven, when time will no longer matter. This past weekend was the annual Great Backyard Bird Count. Whenever I could find the time, I stood by the window, looking out at the dogwood tree that holds a seed feeder, suet feeder, and bird bath. 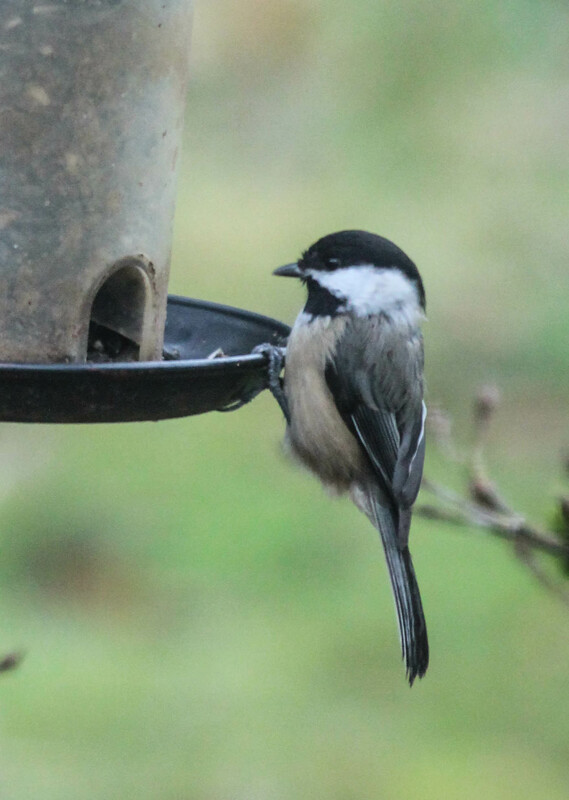 The GBBC asks participants to count the birds at their feeders–or in their backyards. Then you enter your count at their site, and it can be compared with thousands of others from around the world. The number to enter for each species is the greatest number you can see at one time. Sounds easy, right? 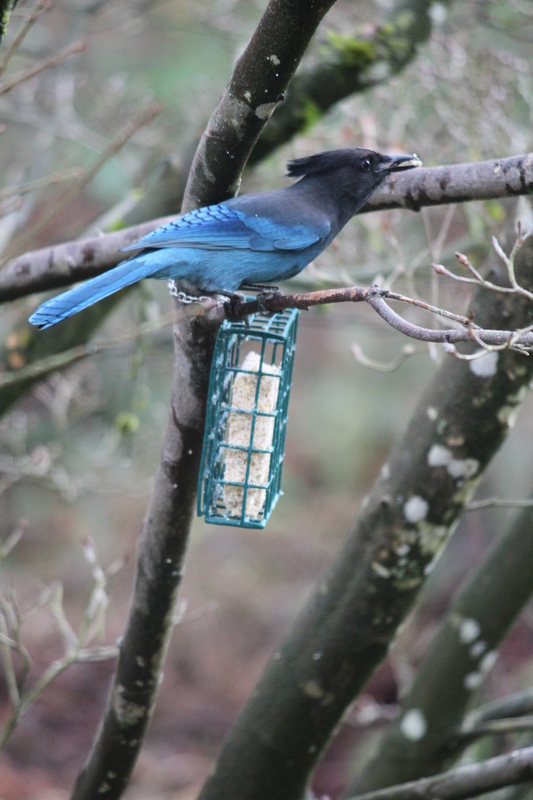 Well, it is when it comes to the big birds–the jays, crows, woodpeckers, and those nasty starlings. The little birds are another story completely. First there are the chickadees. First, because they show up at the feeder before I can even get it hung up in the morning. However, chickadees are perpetual motion machines, never staying in one place for more than a few seconds. And we have two species of chickadees. Try to get an accurate count of those little guys as they whip in and out of the trees and feeders! 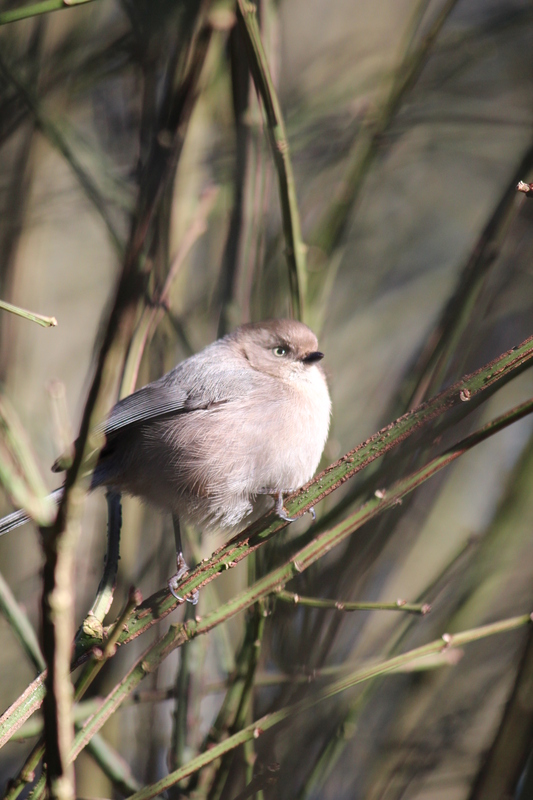 The bushtits aren’t much easier, although they are awfully cute for plain, little gray birds. Then there are the sparrows and related little birds. 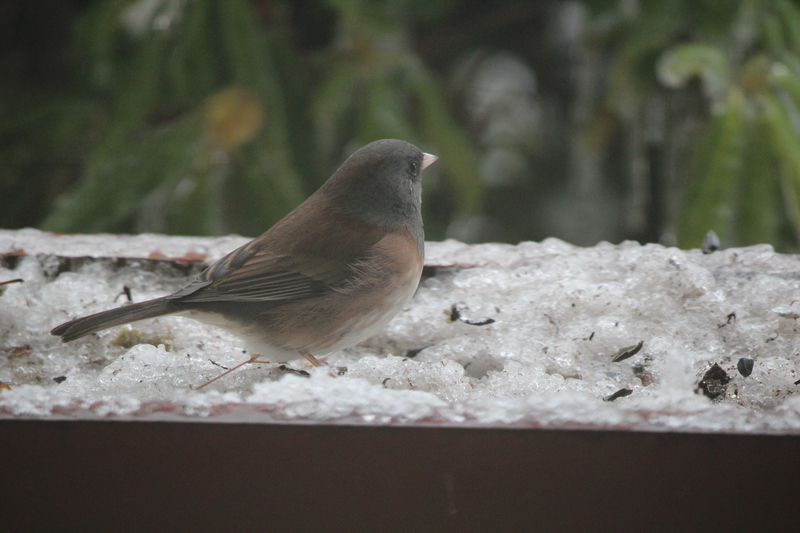 Juncos, finches, etc. All kind of brown, perhaps with some stripes. House sparrows, house finches, golden-crowned sparrows, white-crowned sparrows… A person could get dizzy trying to keep up. At least the towhees are easy to tell apart from the others. 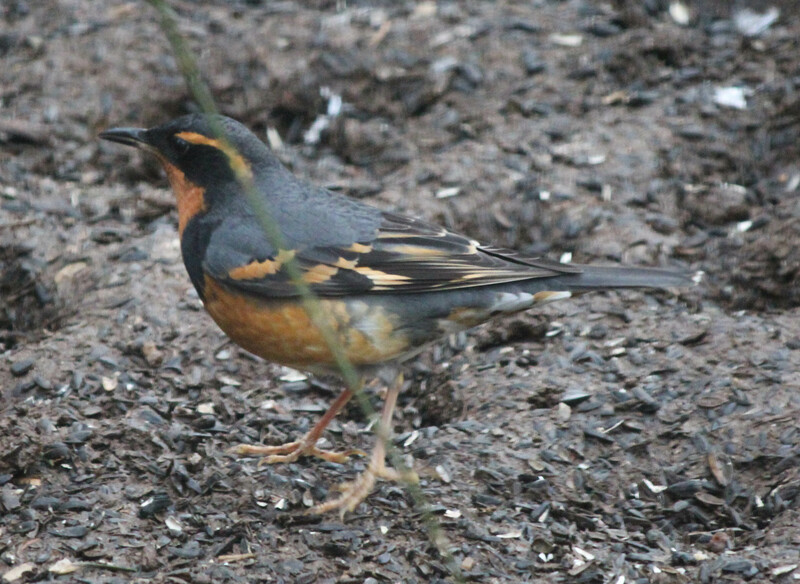 And the lone varied thrush that pecks quietly at the seeds on the ground. 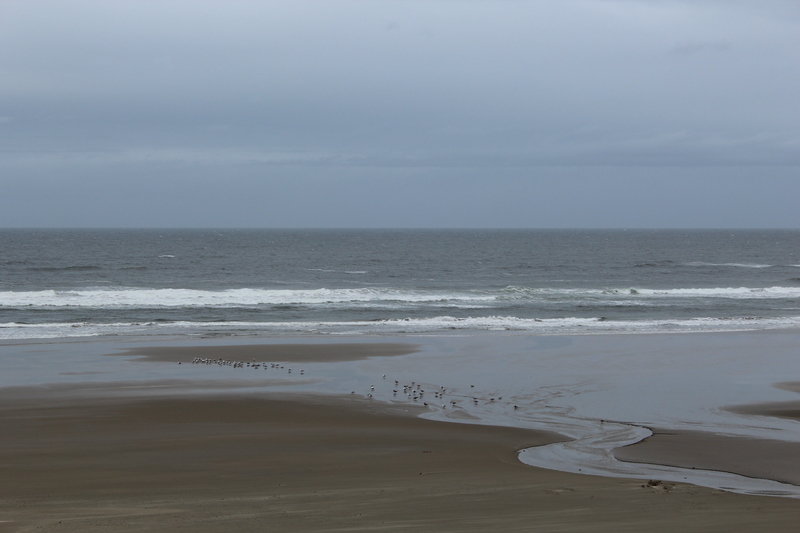 And how about those birds that show up the day before the GBBC and then disappear, only to reappear the day after. The stinkers! And that single Eurasian collared dove that dropped in for the first time the day after. Why couldn’t it have come a day early? Is it really cheating if I add a couple of birds from the next day?? 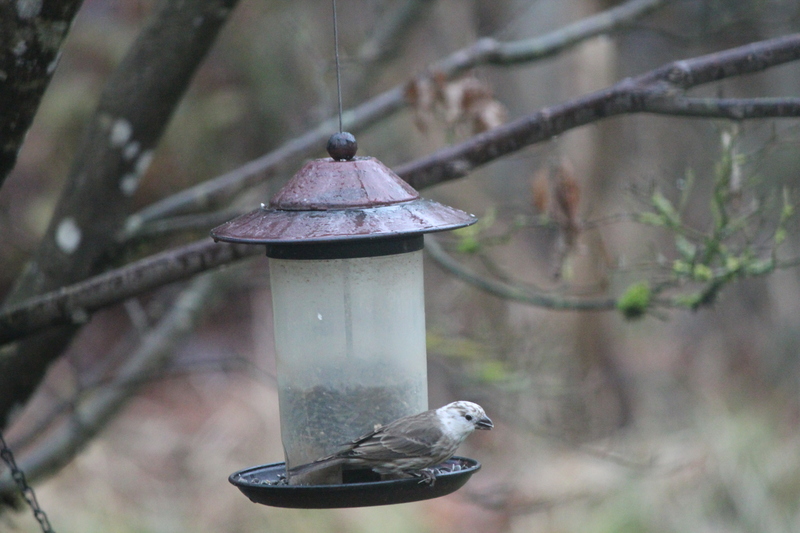 Then there’s that leucistic sparrow-type bird. If anyone can tell me what it is, please do. I am not quite certain. Time to turn in my lists and add my tiny bit of data to the Great Backyard Bird Count. It is nice to be a part of such a great program–even if the birds don’t always cooperate.